NEIL ALTMAN has duped yet another newspaper (the Philadelphia Bulletin) into taking his ridiculous notions about the Dead Sea Scrolls seriously. 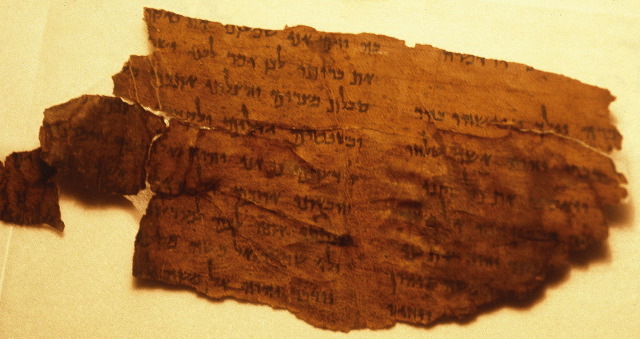 Since their discovery nearly half a century ago, the scrolls and the identity of the nearby settlement have been of great scholarly and public interest as well as heated controversy. Why were the scrolls hidden in the caves? Who placed them there? Who lived in Qumran? Were its inhabitants responsible for the scrolls and their presence in the caves? Of what significance are the scrolls to Judaism and Christianity? In this article, Neil Altman, who has devoted much of his life to studying the scrolls, examines the latest evidence regarding the age and authenticity of these controversial artifacts. While his conclusions are not accepted by everyone in the field, they bring up compelling questions surrounding some of the most famed group of documents in human history. The Dead Sea Scrolls, the crown jewels of biblical scholarship, have been guarded for 60 years. Soon after the existence of the scrolls came to light, a scholarly debate broke out over whether the writings were indeed pre-Christian. Though it was commonly accepted that the scrolls were ancient, many respected scholars had begun to argue that the texts were much more recent in origin. In short order, a scholarly elite emerged and took possession of the artifacts, keeping them hidden from scrutiny. Recently, that group has been challenged to bring the scrolls to the public for closer examination. Now, there is accumulating and compelling evidence that undermines everything we originally thought about the scrolls - including an explosive finding in China that suggests these historic texts date from medieval times. I'm not going to waste time discussing this article. Instead I'll just refer you to my past comments on Altman's erroneous arguments and his twisting of the words of real scholars here, here, here, here, here, and here. But I note that in this article Altman cites the work of Greg Doudna to support the absurd idea that the Scrolls are medieval. Greg thinks no such thing and would not be happy to be associated with this notion. I'll say it again: Altman and his friends are making fools of a good many journalists and newspaper editors, who don't have sense enough to vet their claims independently with real specialists. The University of Wisconsin-Madison invites applications for a full-time, tenure track assistant professor position in Hebrew & Semitic Studies with a specialization in Rabbinics, beginning August 2008. The successful candidate with be awarded the Belzer Professorship in Rabbinics and will be a member of the Mosse/Weinstein Center for Jewish Studies. A Ph.D. is required prior to the start of the appointment. The position requires a demonstrated commitment to excellence in research, teaching and service. Preference will be given to those candidates dedicated to the study of Midrash and classical Jewish thought. The teaching load is 2/2 and includes undergraduate and graduate courses: a one-semester Introduction to Judaism for undergraduates; rabbinic texts in the original and translation; topics in Jewish religion and culture; and occasional graduate seminars. To ensure full consideration, send curriculum vita, three letters of recommendation, academic transcripts of undergraduate and graduate study, and writing sample by October 22, 2007 to: Professor Cynthia L. Miller / Department of Hebrew and Semitic Studies / 1344 Van Hise Hall / 1220 Linden Drive / Madison, Wisconsin 53706-1558. Unless confidentiality is requested in writing, information regarding the applicants must be released upon request. Finalists cannot be guaranteed confidentiality. Women and minorities are encouraged to apply. UW-Madison is an equal opportunity/affirmative action employer. With apologies for the lateness of this information, here is the outline for the new PSCO year, and the announcement of the initial meeting. Please cross-post as appropriate. TOPIC FOR 2007-2008: "Tracing the Patterns, (Un/Re-)Weaving the Threads"
In 1994, John C. Reeves edited and published a collection of essays entitled Tracing the Threads: Studies in the Vitality of Jewish Pseudepigrapha (SBL Early Judaism and its Literature 6, series editor William Adler; Atlanta: Scholars Press). For Reeves, the "threads" refer to the persistent survival (or rediscovery) of early Jewish materials in the literature of a wide variety of religious communities -- especially (but not only) Jewish, Christian, Gnostic, and Muslim. The "tracing" refers to modern scholarship on these materials such as was solicited for that volume. Since both Reeves and Adler are in Philadelphia during the fall term of the 2007-2008 academic year as fellows at the University of Pennslyvania's Center for Advanced Judaic Studies, along with a number of other leading scholars of late antiquity, and since the PSCO itself will be undergoing transition with the arrival of Annette Yoshiko Reed to continue the work of Robert Kraft in the Department of Religious Studies, it seemed an opportune time to take stock of current scholarship in areas relevant to the aforementioned "threads" in their wide geographical distribution in the relevant ancient and late antique worlds. To facilitate discussion between specialists in different subfields, we have chosen to define the sessions by geographical area, rather than by religioust radition, theme, or textual corpus. By following "threads" through regional trajectories, we hope also to assess, not only our literary remains, but also archaeological evidence, inscriptions, etc. We are planning a flexible format, focused less on prepared presentations and more on informed discussion. Some sessions will consist of roundtable discussions; scholars from different subfields and specializations will be invited to exchange ideas and information about the sources, state of current research, methodological challenges, and promising directions for research on specific locales. For other sessions, pairs of participants or individual speakers will share their ongoing research and reflections. Although we do not intend to limit ourselves to the CAJS Fellows, they will provide a rich primary reservoir of discussants and participants. The introductory meeting is scheduled for Thursday, 11 October, 7-9 pm in the 2nd floor Lounge of Logan Hall at the University of Pennsylvania (36th St walkway, just north of Spruce Street). Those wishing to dine together before the seminar will meet at 6 pm in the Logan Lounge to go next door to the food court in Houston Hall. The evening's topic is "Methodological Challenges," with a panel discussion in which the chairs will be joined by Maxine Grossman (University of Maryland; CAJS associate fellow 2007/8) and the editor and series editor of the original "Tracing the Threads"
volume (to which both also contributed articles), John C. Reeves (UNC Charlotte; CAJS fellow in fall 2007) and William Adler(UNC Raleigh; CAJS fellow in 2007/8). He also draws attention to the important recent manuscript discoveries of the so-called European Geniza (i.e., non-Cairo Geniza) project. Lots of Talmudic fragments have been recovered, and at least some from the Mishnah and the Tosefta. Cool. YOM KIPPUR (THE DAY OF ATONEMENT) begins tonight at sundown. An easy fast to those observing it. The biblical precepts for Yom Kippur appear in Leviticus 23:26-32. But how could professor Abu El-Haj possibly make a decision about the claims of biblical scholars or archaeologists in the First Temple period? To make an independent, informed judgment, she would need to know not modern Hebrew conversation, but ancient Hebrew literature, and for the First Temple Period, which is her particular target, also Aramaic, Ugaritic (a significant Canaanite language), certainly all the many and significant North West Semitic epigraphy (inscriptions) relevant to this period, comparative Semitic grammar and syntax, comparative literary studies in Akkadian and Egyptian, and biblical stylistics. These credentials are in no way unusual for graduate students in Bible, and many of them also study far more exotic languages—like Akkadian, Egyptian, Hittite or Sumerian—as well as develop an understanding of ancient Near Eastern culture and history. There are literally hundreds of inscriptions from the First Temple period, together giving much interesting and debated evidence of an ethnicity called Israel who worship a divinity called YHWH. The most important and longest of these inscriptions were discovered in the 19th and early 20th century, considerably before there was any country called Israel or any significant Israeli archaeology. In fact, one major and effective argument against the biblical minimalists is that they cannot adequately explain away this inscriptional evidence. She herself never engages the basic issues concerning the Merneptah Stela, the Moabite Stela, the Siloam Inscription, the Tel Dan Inscription, the evidence from seals and bullae or any of the important inscriptional finds but they speak strongly against her conclusions about ancient Israel. She has only disputed one ethnic identifier for Israel—collared rim pottery—but ignored several others: theophoric names, evidence of circumcision, the presence or absence of pig bones, stone jars and later, immersion pools, depictions of ritually important plants, depictions of ritual objects or the Temple or biblical scenes like the sacrifice of Isaac. As a result, she believes that Israel was not an historical presence in the land but a myth. Biblical minimalists normally stop disputing this at the beginning of the Second Temple period but she often appears to push it further, even to the time of Jesus. Professor Abu El-Haj makes major judgments about the Jewish character of Jerusalem in New Testament times, including that Herodian Jerusalem was not a Jewish city, a most extreme opinion (p. 175-176). She also says that Jerusalem was not a Jewish city after the destruction of the Jewish state because Jews were in the minority during much of its recent history. Would she then consider that the old city of Jerusalem is not now an Arab city because Arabs are now a minority there? These are not casual observations but critical ones, logically necessary to her analysis of the errors of Israeli archaeological museums. By rights, to come to these conclusions she should also be familiar with ancient classical historians, Syriac and Greek, Josephus, Philo, and New Testament scholarship, to say nothing about early rabbinic literature and possibly Latin language and literature. Other than the odd quotation from Josephus, there is little evidence of this either. Without engaging these bodies of knowledge she has no grounds for siding with a bare logical possibility about the events which produced “The Burnt House,” for example, against the consensus of international, not just Israeli, scholarship (p. 145). Without many of these tools, she could not make a judgment about even a footnote or a textual reading in a biblical minimalist article, to say nothing of one of their many conflicting histories of biblical times, Old Testament or New. She merely takes only those statements which most agree with her own tenuous contentions, and that is something that no Bible scholar, no anthropologist, and no archaeologist should ever do. I'm not going to take any position on the whole tenure issue, but I have read the book carefully and I'm pulling together my notes for a post on it here as soon as I can manage. I think I have more sympathy with the biblical "minimalists" than Professor Segal does, but I also think his criticisms above are fair, as are the other critisms in his review in areas where I know enough to deserve to have an opinion. Indeed, many of the same points have occurred to me. Definitely read it all. UPDATE (24 September): I forgot to add that background to the story can be found here, and follow the links back as usual. UPDATE (27 September): I've killed the link, because Segal's essay has disappeared and it was redirecting to a blog on Ahmadinejad. If I can find the piece again, I will relink. UPDATE (28 September): Apparently it was taken down to correct an editing error. I have relinked to the corrected version. A group of Israeli archeologists and public officials who petitioned the High Court of Justice against Prime Minister Ehud Olmert and the Antiquities Authority over ongoing Wakf infrastructure work on the Temple Mount were ordered out of the courtroom during a hearing Thursday, an archeologist said. The members of the nonpartisan Committee Against the Destruction of Antiquities on the Temple Mount had to leave the courtroom while the state-run archeological body presented "secret" evidence to the court. The Department of Religious Studies at McMaster University invites applications for a full-time tenure-track position in Early Judaism, beginning July 1, 2008. The position is at the rank of Assistant Professor. We are seeking candidates who specialize in Second Temple Judaism, with competence in the literature of classical Rabbinic Judaism. Possible areas for research and teaching (at the graduate level) include Philo, Josephus, Septuagint, Dead Sea Scrolls, Apocrypha and Pseudepigrapha, and early rabbinic literature. The appropriate primary and research languages, both ancient and modern, are required; candidates will be expected to teach graduate courses working with texts in the original languages. At the undergraduate level, teaching may be in a variety of courses, especially in Hebrew Bible. Early Judaism is a component of the Biblical field in our department, in which Judaism and Christianity in the Greco-Roman era are studied in conjunction with one another at both the undergraduate and graduate levels. A range of methodologies and approaches is employed (philological, literary, social historical, archaeological, philosophical, theological). Candidates should have an active interest in the broader field of Jewish Studies. The successful candidate must have completed the PhD and will be expected to carry out an independent program of scholarly research yielding significant peer-reviewed publications. Responsibilities include effective undergraduate and graduate teaching and supervision of MA and PhD students. Dr. Eileen Schuller, Acting Chair, Department of Religious Studies, McMaster University, 1280 Main Street West, Hamilton, Ontario, Canada, L8S 4K1. All qualified candidates are encouraged to apply; however, Canadian citizens and permanent residents will be considered first for this position. McMaster University is strongly committed to employment equity within its community, and to recruiting a diverse faculty and staff. The University encourages applications from all qualified candidates, including women, members of visible minorities, aboriginal persons, members of sexual minorities and persons with disabilities. The deadline for applications is November 26, 2007. Candidates whose applications are received by November 5 will be considered for pre-interviews at AAR/SBL in San Diego (Nov. 17–20). Pre-interviews at AJS in Toronto (Dec 16–18) are also a possibility. Aram Society for Syro-Mesopotamian Studies is organising its Twenty Fifth International Conference on the theme of The Decapolis: History & Archaeology, to be held at Oxford University, 07-10 July 2008. The aim of this conference is to study once again the theme of the Decapolis with its new discoveries and researches. The conference will start on Monday July 07 at 9am, finishing on Thursday July 10 at 6pm. Each speaker’s paper is limited to 30 minutes, with an additional 10 minutes for discussion. All papers given at the conference will be considered for publication in a future edition of the Aram Periodical, subject to editorial review. Aram Society for Syro-Mesopotamian Studies is organising its Twenty Sixth International Conference on the theme of The Mandaeans, to held at the School of Oriental and African Studies (SOAS), University of London, 08-10 September 2008. The conference aims to study Mandaeism and its relationship to Near Eastern religions and gnostic movements. It will start on Monday 08 September at 9am, and ending on Wednesday 10 September at 6pm. Each speaker’s paper is limited to 30 minutes, with an additional 10 minutes for discussion. J2: The J2 lineage originated in the northern portion of the Fertile Crescent where it later spread throughout central Asia, the Mediterranean, and south into India. As with other populations with Mediterranean ancestry this lineage is found within Jewish populations. Research note: Many people new to Genetic Genealogy think the J2 haplogroup is synonymous with having male Jewish ancestry. One should note that having a J2 haplogroup assignment does not necessarily indicate Jewish ancestry. The J2 haplogroup is far more ancient than the Jewish religion and is found in many lines with Mediterranean region ancient ancestry. Another relatively more recent mode for J2's entry into some parts of Europe from the Mediterranean areas could have been the Roman Legions and Roman settlements. This implies, not surprisingly, that Israelites and Canaanites shared not only the same language (Hebrew and Phoenician are really nothing more than dialectal variants) but also key genetic material. Incidentally, the data from this genetic marker offer some interesting confirmation to my inferences from first principles in this post, point #2. SOUTHWESTERN UNIVERSITY, Department of Religion and Philosophy, seeks a tenure-track assistant professor of religion with expertise in Judaism to begin fall 2008. Area of specialty is flexible, but could focus on: Hebrew Bible, Judaic studies, Ancient Near Eastern Religions and/or Rabbinic Judaism. Competence in requisite languages is necessary. A commitment to teaching a range of undergraduate religious studies courses, including Introduction to Judaism, within a liberal arts tradition is essential. Candidates must hold or anticipate a Ph.D. in religious studies or a related discipline by August 15, 2008. Consideration of applications will begin November 1, 2007, and continue until the position is filled. Pre-arranged interviews will be conducted at the AAR/SBL meeting in San Diego. Please send applications, including CV and three letters of reference, to Connie Imhof, Faculty Secretary (Religion & Philosophy), Southwestern University, Box 770, Georgetown, Texas 78627-0770. Southwestern University is a selective, undergraduate institution committed to a broad-based liberal arts, sciences, and fine arts education. Southwestern currently enrolls approximately 1,250 students and maintains a student to faculty ratio of 11 to 1. The University`s endowment ranks among the highest per student of undergraduate institutions in the country. In addition to a number of other national organizations, Southwestern University is a member of two consortia of liberal arts colleges, the Associated Colleges of the South and the Annapolis Group. Located in Georgetown, Texas, 28 miles north of downtown Austin, Southwestern is affiliated with The United Methodist Church. For information concerning the University, visit our Web site at www.southwestern.edu. I haven't the patience right now to excerpt them, but they all deal at least in part with this controversy. Shortly after Nebuchadnezzar II destroyed the Temple of Jerusalem in 586 BCE. he built the Ishtar Gate in Babylon. To him Jerusalem was a side show, take it or leave it, but the Ishtar gate was fundamental to his well-being and that of his people. It was the gate whereby the king and Marduk, the god of Babylon, would enter the city each year to inaugurate the New Year on the first of Nisanu (the Hebrew Nisan). It could only be done when the king and the god were both in the city, but it was the founding ceremony that would ensure the continuation of the Empire in good order for another year. ONCE ALL this was completed, the New Year could commence! The culmination of this ritual took place at the Ishtar Gate, the northern gate into the city. Ishtar was the goddess of the moon, and of love and war. Not the consort of Marduk, the chief god and founder of Babylon, she was the chief goddess of the whole country of Babylonia and not just its capital. It is curious that the two deities mainly celebrated in this New Year ritual, Marduk and Ishtar, gave their names to the hero and heroine of the Purim story, to Mordechai and Esther. And what remains of the Jews who were there? Many returned to rebuild the Temple in Jerusalem 50 years after its destruction, but it was destroyed again less than 600 years later, and now only the outer Western Wall remains. But in Babylon the Jews had absorbed the 10-day New Year festival, which they must have witnessed repeatedly, and which to them would have been a sign to reject foreign gods and to hope for the return to Zion, through the Ishtar gate. Cyrus, victor of Babylon, gave them the opportunity. They brought back with them remembrance of the 10-day festival and applied it to their own New Year, starting on the first of Tishrei, and linked it with the fast of Yom Kippur on the 10th, to make that period the Ten Days of Teshuva (Repentance), which are still with us today. Interesting thesis. Two comments. First, I have never before heard of the Enuma Elish being interpreted to say that Tiamat was raped, and I'm skeptical. Second, it's possible that the Akitu Festival influenced the Jewish New Year, but if so it's odd that the Babylonian festival is in the spring, close to the time of Passover, and the Jewish New Year is in the autumn. My own view is that Rosh HaShanah and Yom Kippur (the Day of Atonement) descend from a royal autumnal re-enthronement festival that can be reconstructed to some degree from the Psalms and which was salvaged and adapted in post-exilic Priestly circles after the Judean royal cult had been destroyed by the Babylonians. I would by no means rule out influence from the Akitu Festival, but it looks to me as though the basic concepts of the Jewish festivals could have been adapted from indigenous pre-exilic New Year traditions associated with the Judean Temple and royalty. These may well have ultimately been inspired by Babylonian models, but they would have been a fundamental feature of pre-exilic Judean society, not an afterthought brought in after the exile. Last night, Barnard religion professor Alan Segal lectured on the lack of academic accuracy in the work of assistant professor Nadia Abu El-Haj, whose tenure process has sparked controversy due to her book in which she denies the existence of the ancient Jewish state of Israel. In his lecture, titled “What Biblical Archaeology Tells Us About the First Temple Period,” Segal focused on the role of archaeology in proving certain aspects of the Bible to be true, including the existence of a Jewish state in Israel in ancient times. “The problem is that everyone wants someone like her for the diversity of the college, and I agree, she looks great on paper. But then you read the book and you say, ‘No, this isn’t the right person,’” said Segal, who stated he does not believe that Abu El-Haj, a Fulbright Scholar and Palestinian-American, should be granted tenure. For more on this tenure controversy go here and just keep following the many links back. UPDATE (19 September): More here. GOLF, THE UNIVERSITY, AND PALEOJUDAICA are all notable features of St. Andrews according to Ferrell's Travel Blog. THE MASTER'S THESIS of James Darlack, of the Old in the New blog, is available online for downloading. It's called "Pray for Reign: The Eschatological Elijah in James 5:17-18." The team Histoire et Archeologie de l'Orient Cunéiforme/Archeologies et Sciences de l'Antiquité (HAROC/ArScAn) of the CNRS invites you to the celebration of the 150th anniversary of the decipherment of cuneiform Akkadian. Within the frame of the "Fête de la Science", from October 8th to 14th, 2007, the team HAROC/ArScAn (UMR 7041 of the CNRS, Maison René Ginouvès d'Archéologie et d'Ethnologie ) proposes two cultural events to celebrate this anniversary. AN EXHIBITION, "Les écritures cunéiformes et leur déchiffrement" in the hall of the Maison René Ginouvès is set for October 8th to the 12th, 2007. The main steps of the rediscovery of the Ancient Near East, as well as of the decipherment of the main cuneiform scripts (ideographic, syllabic and alphabetic) will be presented through fifteen posters. A SERIES OF 11 LECTURES on the topic "Histoires de déchiffrements" will take place on October Friday 12, from 9.30 am to 5.30 pm, at the University of Paris X, Nanterre, bat. B, conference room. The eleven lectures will deal with the rediscovery of the Ancient Near East and the decipherment, the personality of the decipherers, the mechanism and use of cuneiforms scripts, but also of the Phoenician, Linear B, and Maya scripts. ROBERT ALTER is interviewed by NPR's All Things Considered about his new Psalms translation. In the Jewish Bible, the Book of Daniel is located in the Hagiographa, whereas in the LXX this book appears in the Prophets. The location of this book in the Bible has been discussed by numerous scholars, and this article attempts to demonstrate that the Book of Daniel was always located in the Hagiographa in the Jewish Bible. Direct and indirect proof is offered that the Book of Daniel was considered part of the Hagiographa by the end of the Second Temple period, and certainly by the time of the Mishnah. While there is evidence that the attitude of Babylonian rabbis to this book changed, this does not prove that the book was relocated from the Prophets to the Hagiographa. Rather, this change might be related to the beginnings of the differentiation between the status of the Hagiographa and that of the Prophets, a distinction that would be formulated explicitly only in the Middle Ages. A widespread tradition about Solomon’s ability to control demons existed among Jews and non-Jews since the Second Temple period. This tradition had two components: Solomon was assisted by demons in building the Temple, and Solomon healed the sick by driving out demons. While the former notion is mentioned explicitly in rabbinic sources, the latter appears only implicitly in a Baraita about concealing the Book of Remedies and in an allusion in the seventh chapter of Bavli Gittin. Apparently, the Sages were familiar with this tradition, but they intentionally chose to avoid mentioning it. This may be due to the Sages’ desire to obscure any link between Solomon and Jesus, to whom the ability to drive out demons was also attributed. In more than seventy different places in his commentary on the Babylonian Talmud, Rashi includes chronological information about Babylonian Amoraim. In many of these cases Rashi’s interpretation contradicts the chronological information in Seder Tannaim ve-Amoraim or Iggeret Rav Sherira Ga’on, or demonstrates some other difficulty. This phenomenon raises doubts regarding the common assumption that Rashi was familiar with Iggeret Rav Sherira Ga’on and used it regularly as the main source for his chronological data. We argue that Rashi based his chronological knowledge solely on the Talmud, and not on Iggeret Rav Sherira Ga’on or on Seder Tannaim ve-Amoraim. Our analysis then re-examines the main proofs cited by scholars to support this common assumption. The laws of weights and measures in rabbinic literature are characterized by rigorous – sometimes perfectionist – standards. The extraordinary nature of these standards becomes conspicuous in a comparison between these laws and, for example, the laws of ona’ah. The punctiliousness here is partly explained by the resemblance between the conduct of a merchant – measuring and weighing – and of a judge: the merchant, measuring out quantities and amounts, is obligated to avoid committing any injustice. His weights must be just, his measurements exact. Further study reveals that the image of the judge is, in fact, the earthly reflection of the image of Divine justice. At the center of this image are the tools of Divine judgment: just weights and measures. A person who weighs and measures is required to bear Divine justice in mind at all times, as he employs the tools of earthly justice. Now any distortion of measurement – beyond representing deceit and injustice – becomes a rebellion against God. One who measures falsely may be compared, as it were, to an idolater. Examining the history of the story of Mordechai’s dream (MD) and its journey from one literary context to another over the ages may help illustrate the different approaches used by authors in different eras to adapt the text to their own particular literary frameworks. In the Greek additions to the Esther scroll, MD serves as a kind of introduction. The dream, together with its interpretation, frames the plot, providing it with a new context. This would mean that the Second Temple-period scribes tampered with the biblical text, altering the very nature of its story. The Hebrew reworking of MD recorded in Josippon is apparently based upon the Vulgate, where MD, located with other additions at the end of the scroll, lost its original context. Josippon’s composer reworked MD and inserted it into the plot sequence as a crucial link. Here the biblical text is illuminated via a medieval extra-biblical composition, in the form of rewritten Bible. Midrash Esther Rabbah draws upon the MD version found in Josippon, and uses MD to gloss the verses illuminating their exegetical-midrashic aspects. MS Leipzig, Universitaetsbibliothek B.H. fol. 1, a thirteenth century Ashkenazi manuscript of the Pentateuch with Onqelos and Rashi’s commentary (with Haftarot and Megillot with Rashi’s commentary), contains several additions to Rashi’s commentary on the Pentateuch; some originate with Makhir, the scribe of the manuscript, some with Rabbeinu Shemaya, Rashi’s student and scribe, and some with Rashi himself. This was first noted by F. Delitzsch in his 1838 catalogue of the Hebrew manuscripts in Leipzig. Later, in 1902, A. Berliner brought a selection of the R. Shemaya and Rashi notes (without distinguishing between them). More recently, in 1991 (and again in 1995) A. Grossman returned to this material, stressing its importance for the history of Rashi’s commentary. He noted that Berliner brought only about one quarter of the relevant notes. Grossman reviewed all the material and summarized the numerous R. Shemaya notes, but brought only seven (out of approximately 50, according to Grossman’s count) of Rashi’s notes. He stressed the difficulty of reading the notes, which were on microfilm; Berliner also had stressed the difficulty of reading the notes, and in fact, someone else transcribed them for him. In 2003 we went to Leipzig to study the manuscript itself. This study of Rashi’s additions to his commentary is a result of that research; we will not deal with the other notes, those of Makhir and of R. Shemaya. According to our enumeration, R. Shemaya brought all 82 additional notes in MS Leipzig that originate with Rashi. Almost all of these notes end with “R.” (= Rabi), or “M.R.” (= mepi Rabi), signifying that they stem from Rashi. Furthermore, Makhir added his own additional comment: “kakh katav Rabbeinu Shemaya,” to almost all of these notes, noting that these attributions (“R.”; “M.R.”) were from the hand of R. Shemaya. In fact, Makhir noted several times that he had before him the autographed copy of R. Shemaya; thus, the above additional comment. It should be stressed that the notes in the original manuscript are not particularly difficult to read, with the exception of a few. Rashi’s additions can be divided into a number of types: (1) additions based on Rabbinic literature; (2) linguistic and lexicographic clarifications; (3) clarifications concerning the general tenor of the verse; (4) clarifications and expansions of his original comment; (5) additional French glosses for clarification; (6) additions concerning the borders of Erez Israel; (7) additions that are similar to, or are compatible with, Rashi’s comments elsewhere. At the conclusion of this study, after bringing the numerous additions and the relevant sources, we summarize the spread of these additions in the manuscripts of Rashi’s commentary and in the early printed editions (nine incunabula and two sixteenth century editions). To study the manuscripts, we have chosen, in addition to MS Leipzig 1, a sample of 22 out of at least 241 manuscripts. The results show that the manuscripts and printed editions contain 25% of the additions, at most. Furthermore, in almost all cases, the attribution that the comment is an addition (“R.”, “M.R.”) has been omitted. Thus, today’s editions of Rashi’s commentary on the Pentateuch contain some of Rashi’s additions to his commentary, but they are not identified as such. Only with the help of MS Leipzig 1 are we able to identify Rashi’s additions to his commentary. The text of the Talmud has been preserved in various MSS, and hence textual criticism of this work is of paramount importance for any critical and exegetical study of this work. Nahmanides’ was familiar with different textual traditions of the Talmud. In his writings, he indicated which version of the Talmud he considered most accurate. Generally, he preferred the version of the Geonim and the Sephardic scholars to the French and Ashkenazic versions of the Talmud. MS Hamburg 165 was copied in Gerona, where it was concluded in 1184, in spatial and chronological proximity to Nahmanides, and it appears that Nahmanides might have been acquainted with traditions similar to those in this MS. Hence, this MS seems to be a good starting point for analyzing Nahmanides’ approach to textual analysis. This article accordingly presents a detailed analysis of Nahmanides’ text-critical comments in light of the readings of MS Hamburg 165, and concludes that Nahmanides did not invariably abide by fixed text-critical rules, despite his aforementioned preference for the version of the Geonim and the Sephardic scholars. Rather, he sometimes reached his text-critical conclusions on the basis of localized, “ad hoc” analysis of relevant textual variants. R. Yehuda Almadari’s commentaries on several tractates of Hilkhot Ha-Rif have been published in the past. That Almadari wrote commentaries on order Moed is clear from the testimony of R. Chaim Joseph David Azulai (Hida). To date, however, no manuscript has been found that was explicitly ascribed to Almadari. Nevertheless, over the years various anonymous texts have been attributed to this scholar because of their style and the sources they cite. I have recently identified a large portion of Almadari’s commentary on the order of Moed in an Ashkenazic manuscript, where this commentary appears next to the Rif. The author’s identity can be established in light of three citations in Almadari’s name found in R. Johanan b. R. Reuven’s commentary on the Sheiltot and in the Hida’s writings. In addition to providing us with Almadari’s commentary on many additional tractates, this discovery contributes to our knowledge about the geographical distribution of Almadari’s writings. Until recently, scholars thought that this material had not reached communities to the west of Italy. We now know that Almadari’s writings were studied and copied in Ashkenaz as well. This manuscript also sheds light on various issues addressed by previous scholars, such as the identity of some of the names mentioned in Almadari’s commentaries. This article focuses on the theological dimension of a topic neglected in the scholarship on Hasidism: the extensive literature of popular hagiographies in Yiddish. A post-Holocaust work, Seyfer Kedoyshim: Rebeyim oyf Kidesh-Hashem (Menahem Unger, 1967), is contrasted with a representative example of pre-World War II Hasidic hagiography, the anonymous Beys Tshernobl (1926). The article demonstrates that the theological differences are profound. The “living father,” God, present in a story in the earlier compilation, is no longer accessible in the later work, where a moving story depicts a Rebbe calling, in vain, on his own dead father to save the Jews of Poland from destruction. In the post-Holocaust context, the Hasidic Rebbe as legendary hero has been transformed from a superman, sharing divine power, to a representative Jew, suffering and dying with his people. I wonder whether Jews have it too. In any case, this development is likely to add new complications to the already fraught historical politics of the region. A Lebanese genetic scientist who has been following the genetic footprint of the ancient Phoenician civilisation across the Mediterranean for the last five years has found that close to one-third of modern-day Maltese share a genetic link with the ancient Phoenicians. Thirty per cent of DNA samples taken from Malta have been found to share a common and ancient genetic marker, known as the J2 haplogroup, with the Phoenician civilisation, which had colonised Malta for much of the first millennium BC. Research carried out by Lebanese geneticist Dr Pierre Zalloua has shown that while a relatively high degree of Spaniards and Tunisians also share the marker, the Maltese population had a predominantly high proportion. The research project, funded by a $1 million grant from National Geographic’s Committee for Research and Exploration, issued its preliminary results in October 2004 and was famously the subject of a National Geographic Magazine focus that year. I can't remember hearing about the National Geographic study in 2004, and I don't seem to have noted in the blog, but here's an excerpt of the article in the October 2004 issue of the National Geographic Magazine and here's a related follow-up article about the Maltese connection. UPDATE (19 September): Jews too! For this and some discussion of the implications, see here. Learn more about this institution in The Chronicle's Employer Profiles section. History: The Department of Near Eastern Studies at Princeton University invites applications for a tenure-track position in the language, literature, history, and culture of Syriac Christianity in the Late Antiquity. The position is to begin September 1, 2008. Rank: Assistant Professor. Ph.D. required. The ability to teach one or two other languages of Near Eastern Christianity is desirable. Send letter of application, curriculum vitae, and two writing samples (articles or chapters), and have three referees write directly to: Syriac Search Committee Department of Near Eastern Studies, 110 Jones Hall, Princeton University, Princeton, New Jersey 08544. The deadline for receipt of all materials is October 31, 2007. Princeton University is an Affirmative Action, Equal Opportunity Employer. For information about applying to Princeton and how to self identify, please link to http://web.princeton/sites/dof/ApplicantsInfo.htm. From the Chronicle of Higher Education via the Agade list. I started this book a while ago, but got distracted with other things. I hope to get back to it this fall, because it is of interest for my work on Massekhet Kelim, The Treatise of the Vessels," for the More Old Testament Pseudepigrapha Project. THREE GOOD, TACKY, PREPOSTEROUS CULT CAMP CLASSIC HISTORICAL EPICS are out on DVD. The young Joan Collins and Lana Turner look "like a milion dollars." In the world of academia today, professors are constantly under scrutiny for their research findings and published work, especially in the politically polarizing field of Middle Eastern studies. Nadia Abu El-Haj, an assistant professor of anthropology at Barnard, has been attacked by fellow professors and alumni for one of her books, Facts on the Ground: Archaeological Practice and Territorial Self-Fashioning in Israeli Society, in which she states that Israeli archaeologists went out of their way to find archaeological remains that would support the long history of a Jewish state in Israel. Because professor Abu El-Haj examines sensitive and often contentious topics, the debate over her tenure has become a heated fight that blurs the line between the merit of scholarship and the implication of her ideas. Columbia must look beyond the strong feelings of non-academics and focus solely on the credibility of the professor’s work and scholarship. UPDATE (18 September): More here.